Caring for a blind cat isn’t as difficult as you’d imagine. In fact, it’s not much different from caring for a sighted kitty—you just need to have a few extra considerations. Whether you’re thinking about adopting a new cat or your resident kitty is facing vision loss, there are many ways you can accommodate a blind cat in your home. Some kittens are born without eyes or with eyes that do not function. More commonly, cats lose their sight as a result of trauma, illness, or conditions like high blood pressure, toxoplasmosis, glaucoma, cataracts, or scarring caused by untreated in-turned eyelashes. If you notice your sighted kitty displaying any of these symptoms, get him to a vet right away for analysis. The good news is cats are generally very adaptable to life without sight. Felines’ sense of hearing and smell is advanced enough that most cats are able to function normally and live a very happy life. The approach to introducing a newly adopted blind cat to your home is very similar to introducing a sighted cat. First begin by setting up a main room or “safe room” where the kitty has food, water, and a litter box, and is apart from other pets in the household. Spend time playing with him and providing him with treats and noisy toys. Once he seems comfortable in this room, slowly allow him to explore other areas of the home. Make sure to supervise, cover sharp edges, and block off stairs for the time being. Remember, you’ll want to take things slow and steady. Keep the setup of rooms consistent and the house clean, and avoid moving furniture. Eventually your cat will feel more confident with the layout of the house. If you feel comfortable letting your cat navigate stairs to another story of the house, consider “tagging” the area with a consistent smell. For example, mark the top of the stairs with a lavender scent and the bottom of the stairs with a vanilla scent. This will help your cat know when he can expect to start climbing up or down and when he will be on level ground. Above all, be patient. 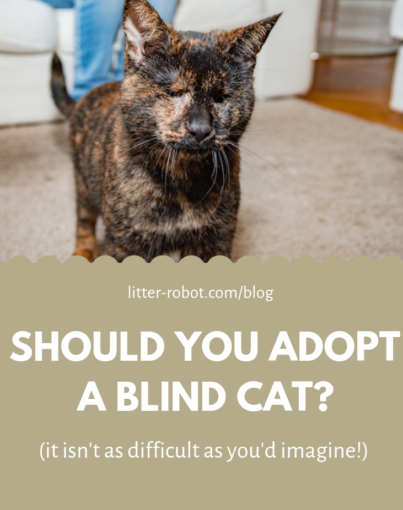 Adopting a blind cat may mean slower progress at first, but in all likelihood you’ll hardly notice the difference from having a sighted kitty! If you can find room in your heart (and home!) for a cat that has lost his vision, you’ll be repaid in full with love and gratitude. Next Post Cat Scratch Fever: Rock Song or Real Disease?